Navies are shrinking. All over the western world fewer warships are being built as replacements with the inevitable result that navies are smaller then they used to be. It can, and has been, argued that as modern warships are more effective then their predecessors this lack of hulls makes little or no difference. Unfortunately for this belief, the threats to modern warships have increased in efficiency at the same rate. In the final analysis fewer ships means fewer ships and a smaller navy. No simple solutions exist. A combination of efforts, including those designed to contain ship requirements and some investment in improving shipbuilding efficiency, might be able to reduce cost escalation. However with tighter and potentially diminishing shipbuilding budgets, there is a need to make hard choices between the capabilities and numbers of ships. The fleet can be rebalanced by supplementing the currently planned large surface combatants with the procurement of smaller or less expensive ships. One way to achieve this high-low mix of warships is to supplement the expensive destroyer/frigates with less expensive Offshore Patrol Vessels (OPVs). These vessels, often built to commercial standards, are becoming increasingly popular among the worlds Navies. First announced in July 2007 the Arctic Offshore Patrol Ship Project is a Government of Canada procurement project for acquiring 6-8 ice breaking vessels for the RCN that is part of the National Shipbuilding Procurement Strategy. The vessels are to be based on the Norwegian Svalbard class and as of 2007 are projected to cost $3.1 billion CAD to construct with a total project procurement budgeted to cost $4.3 billion in order to cover maintenance over the 25 year lifespan of the vessels. These ships are now long overdue and given the rates of inflation cited above there is no reason to believe that this figure is still relevant. These expensive ships will not make good OPVs nor are they icebreakers. The compromises in their design necessitated by their dual role mean that they will be of limited use as either OPVs or as Arctic patrol vessels. What the RCN needs is real OPVs, something like the New Zealand Protector class OPV. The two Protector-class offshore patrol vessels (OPV) were designed by STX Canada Marine and built in Australia by Tenix Defence. They completed their operational and system qualification testing in September 2010. The two 1,900-tonne OPVs have a long endurance to enable patrolling of the full EEZ. The core crew consists of 37 crewmen, but they can accommodate an additional 33 personnel. The OPV hulls are ice-strengthened to provide Lloyds ice class 1C protection (thin or broken first year ice to a maximum depth of 0.4m). As planned, the introduction of these capable OPVs has freed up frigates for tasks further afield. Although these vessels have design issues, for example high weight brought about by ice strengthening, these issues have been addressed and a Canadian version could benefit from New Zealand experience. The suggestion has been made that the Canadian Coast Guard could become an armed service. The barriers to this idea are as much cultural as technical but armed icebreakers, real icebreakers, would obviate much of the need for naval vessels capable of Arctic patrols. If it was necessary it would still be possible for the navy to have one armed genuine icebreaker to be deployed once a year for the duration of the Arctic shipping season. The RCN needs numbers to be effective. The current program of ship building will not deliver those numbers even if it is completed as planned, an unlikely event. The answer is OPVs. 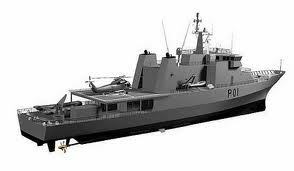 Reasonably well armed and equipped comparatively inexpensive patrol vessels that have not been compromised by the need to fulfill a Government promise.